In the fall of 2013, I pronounced myself cured of plantar fasciitis. I’m still cured, doing plenty of hiking and walking and running, but what does “cured” mean? It means functional, to me. If I fail to do the right stretches and wear the right footgear, I very quickly find my walking limited. But I don’t fail to do those things, and now there is no limit. The question is: The tissues of the plantar fascia, once deranged by age and/or trauma, can they ever go back? Or can they not, and it’s a matter of having your PF “managed?” With the right combination of “self-cure” regimens, the docs tell us, 90% of us can cure. I did it. But will the cure mean regaining that perfect alignment that the plantar fascia had when they were sound? You can see it in the microscope and the arthroscope, the docs tell me, when you see what were once tightly woven, perfect threads of smooth parallel tissue, and now the tight weave is ruptured and threads are torn, and now it’s not perfect. SO it’s not perfect. That doesn’t mean you can’t get it back to functional. Cured, in my opinion, means getting back to the point where you can live a normal life without pain or even discomfort. 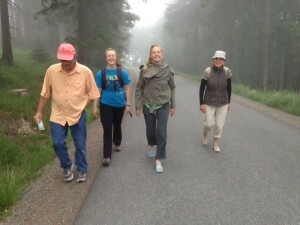 Nowadays I’m back hiking up mountains with impunity, so that’s cured as far as I’m concerned. Sure I can still feel that place, feel that my plantar fascia (right foot) is not the virgin tissue it was. I even imagine I can feel that if I were to stop wearing the right shoes and orthotics, and doing the proper stretches, it could come back. So I wear the right stuff and do the right stuff. Cured? You bet! 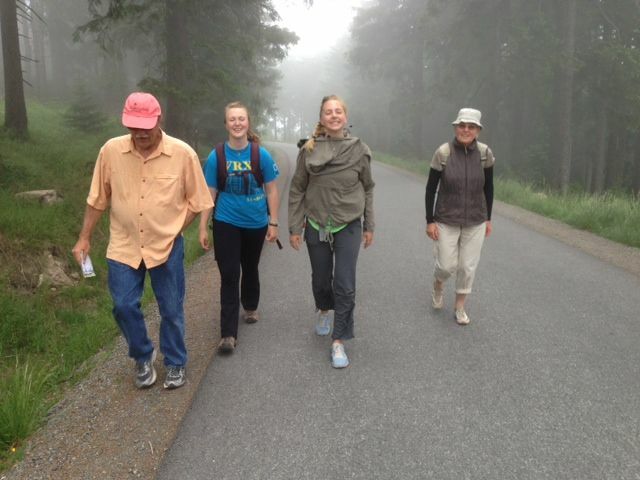 Me [the old bloat-belly on the left] and the gang in summer 2013 doing the 7-mile hike up the Brocken in the Harz Mountains, the highest point in northern Germany. A year earlier, walking around the grocery store was a pain. For that estimated 90 percent of people who can self-cure, without surgery, we hear a variety of estimates on how long it takes, ranging from 9 months to 24 months. Some (with plantar fasciitis that is not too bad, assumably) even speak of curing within weeks. But … a plantar fasciitis cure? What does that mean? Plantar fasciitis typically afflicts people in middle age or later in life. Before that, who ever worried about that apparently most solid piece of the body, the heel? So when we talk about a plantar fasciitis cure, does that mean that the heel will return to whatever unspoiled condition it was in youth, never to fail again? Or is it just a matter of reducing or eliminating the chronic inflammation, while something has changed permanently and will always have to be managed? When plantar fasciitis suffers are exchanging talk of experiences and treatments, they often find themselves wondering where in the heck the other person is coming from. Keith R. runs marathons. He has plantar fasciitis, he says, but what he does is roll a golf ball under his foot and that really helps, and he keeps on running marathons. Barb L. says, oh yes, she has plantar fasciitis. But all she has to do is hold an Achilles stretch one time, for 90 seconds, once a day in the morning, and she’s good to go hiking. That’s why such broad statements as saying self-cure can happen within 10 months, a year or 24 months are fairly misleading, he says. But these patients have the same diagnosis: plantar fasciitis.